Neurotransmitter expression has long been thought of as a defining phenotypic property of adult neurons. However, it has now been shown that most neurons co-release multiple signaling molecules. 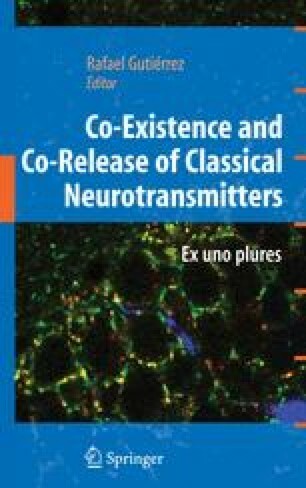 Many examples of neurons that co-release a classical transmitter (e.g., acetylcholine, norepinephrine or glutamate) and neuromodulators have been demonstrated, but neurons can also co-release more than one classical transmitter. Defining the mechanisms that determine released transmitter(s) is important for understanding neural function since this largely determines the influence of neural activity. This chapter details evidence showing that mammalian sympathetic neurons co-release acetylcholine (ACh) and norepinephrine (NE). Sympathetic neurons project to body tissues including blood vessels and heart to control functions such as regulation of blood pressure and cardiac output. Transmitter choice in sympathetic neurons is controlled by target-derived, soluble growth factors. Current data suggests that these factors may operate to regulate the relative amounts of ACh and NE released by sympathetic neurons, which may play an important role in homeostatic regulation of essential physiological processes.